J.M. Snyder » Old Familiar Song now available! Old Familiar Song now available! 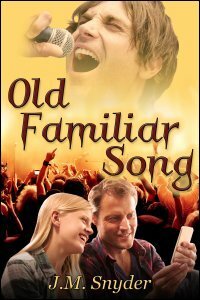 My latest novel, Old Familiar Song, is now available in e-book format! I’ll tell you a secret — the inspiration for this story was a photo I saw on Joey Fatone’s Instagram account … yes, I follow as many of the guys from ‘N Sync as I can on social media. I’m still a huge fangirl at heart. He apparently took his daughter to a Justin Timberlake concert (how cute is that?) and when they went backstage afterward, he posted an image of his daughter and Justin on Instagram. Which got me thinking … I mean, I did write boy band slash for years, you know?